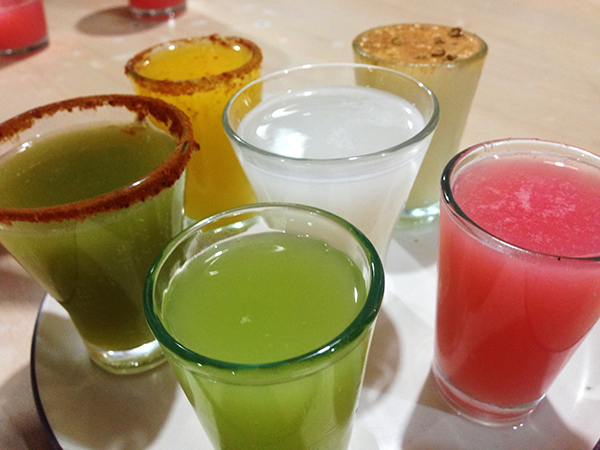 A flight of pulque. Clockwise from the top: oatmeal, guava, lime, celery, mango, and plain in the center. We were way too old to be in this place. We were definitely the creepy old couple. Looking around the bar, most of the people drinking around us looked to be in their early twenties, and perhaps younger: the drinking age in Mexico is 18, after all. And more than that, there was a youthful rebelliousness in this crowd seldom seen Mexico City: in general mild temperatures and Catholicism resulted in conservative dress. But in the pulqueria, facial piercings were the norm, women bared their shoulders, and one crusty punkette asked if we would like to buy a pot brownie (brownie de cannabis). My husband and I were recently married (late in life, by some standards, at the ages of 30 and 31) and honeymooning in Mexico City, when curiosity led us to a Pulqueria. Pulque is an ancient drink made from the fermented sap of the agave; it is thought to have been developed at least 2,000 years ago. Distill that juice, and you get tequila (or mezcal); ferment it like beer, and you get pulque, thick and milky white. A staple of Aztec life, for many years it survived as a drink of the working class; but recently, pulque has been receiving press for its growing popularity amongst Mexico City’s youth. The Pulqueria La Risa, where we sat, has been pouring the thick beverage for over a century. 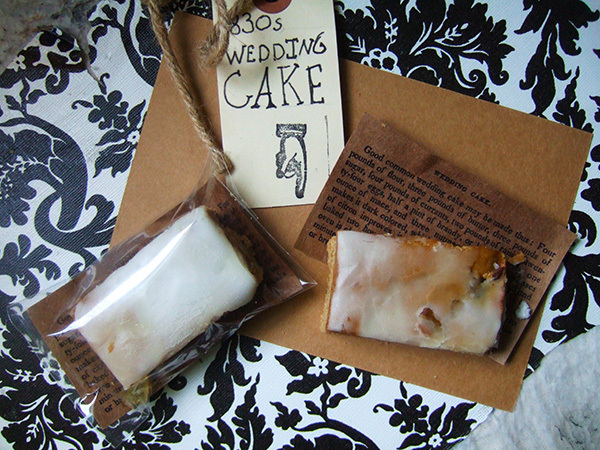 In the modern incarnation of this drink, fruit juices, or nuts and grains along with sugar are added. 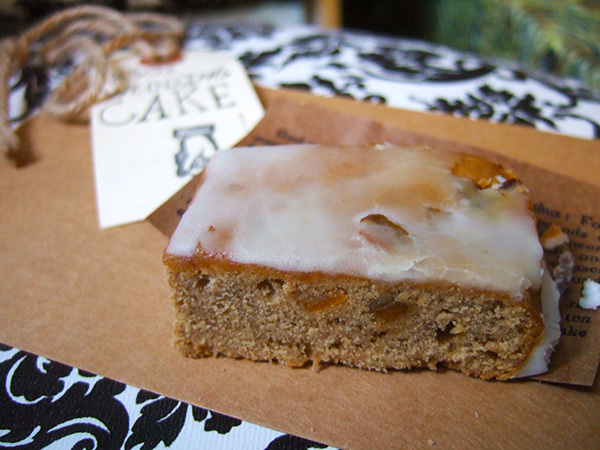 On the day we visited, the sabores de dia included Guava, Mango, Celery, Blackberry, Oatmeal, and Pine Nut. In its pure state, I found pulque to taste like stomach acid, so the addition of sweet fruit juice is a huge improvement. The result is something like a wine cooler: sweet in flavor, but with an ABV on level with a beer. I think it’s wine cooler-like qualities are responsible for its resurgence amongst the young. The drink is even beginning to make its way to New York City; Pulqueria, in lower Manhattan, offers ginger-peach and tomatillo pulques alongside a full Mexcian menu. A glass of pulque costs $14, about ten times the going price in Mexico city. Do I think pulque will be a huge hit north of the border? Not likely. After carving out a small corner in the densely packed bar, my husband and I ordered a pitcher of oatmeal pulque. Sweetened and topped with cinnamon, its the breakfast that gets you drunk. We had planned to order several pitchers, and perhaps a discrete, foam, to-go cup, and get slowly drunk on a hot afternoon. But after the first pitcher, our stomachs were full and grossly distended. Pulque is often known as a meal in a glass, packed full of calories and vitamins, and is incredibly filling. 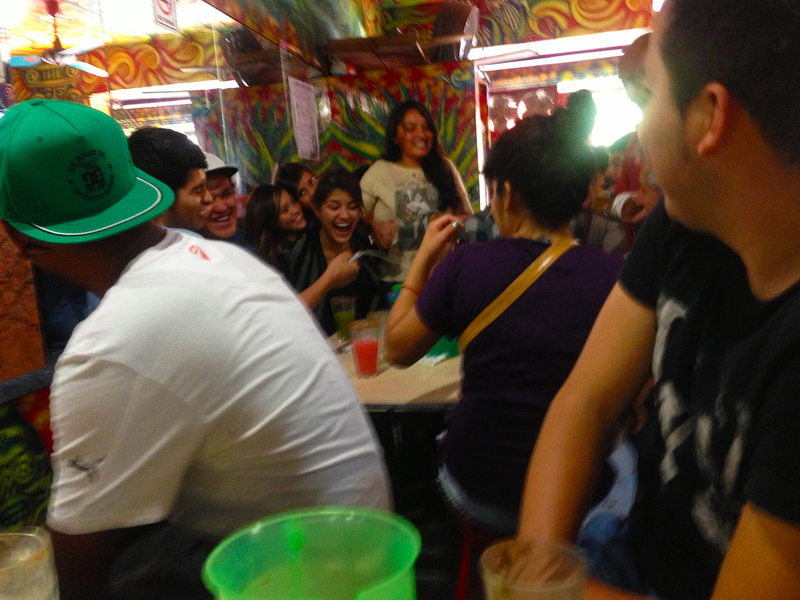 We left, sober and gassy, and fairly confident that that was the first, and last time, we’d try to get drunk on pulque. Published on July 20, 2013 in native american and travelogue. 4 Comments Tags: Mexico. 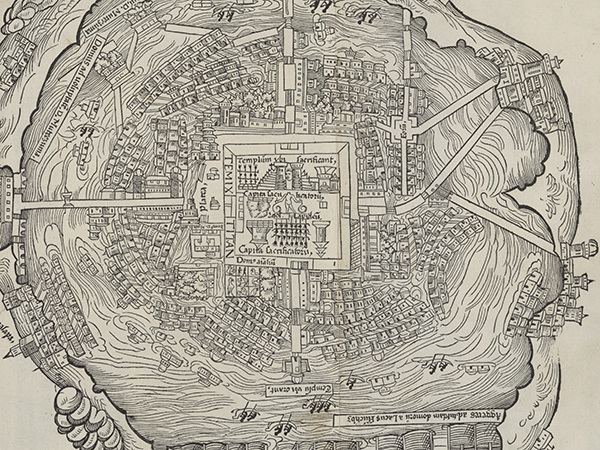 Map of Tenochtitlan from the Letters of Hernan Cortes to Charles V, 1524. Library of Congress. We stood in front of a modern day market–one that sold kinda cheesy, but loveable, tourist goods–and our guide pointed to a map. “In Tenochtitlan, we would be standing here, on the site of the market.” A modern day market was on top of a historic one, the latter buried somewhere beneath our feet. For our honeymoon, my husband and I traveled to Mexico, and we spent the first half of our trip in the capital city. Mexico City sits on the historic site of Tenochtitlan (1325-1521), the Aztec/Mexica capital city and one of the last great Central American cities to fall under Spanish Colonial rule. Famously built on top of a lake, where an eagle clutching a serpent stood on a cactus on a swampy isalnd, it was a highly defendable collection of man-made islands veined by canals. Now, each island roughly corresponds to a different neighborhood in the city (although Mexico City is far larger today); in many circumstances, Spanish colonials built buildings right on top of existing native structures. 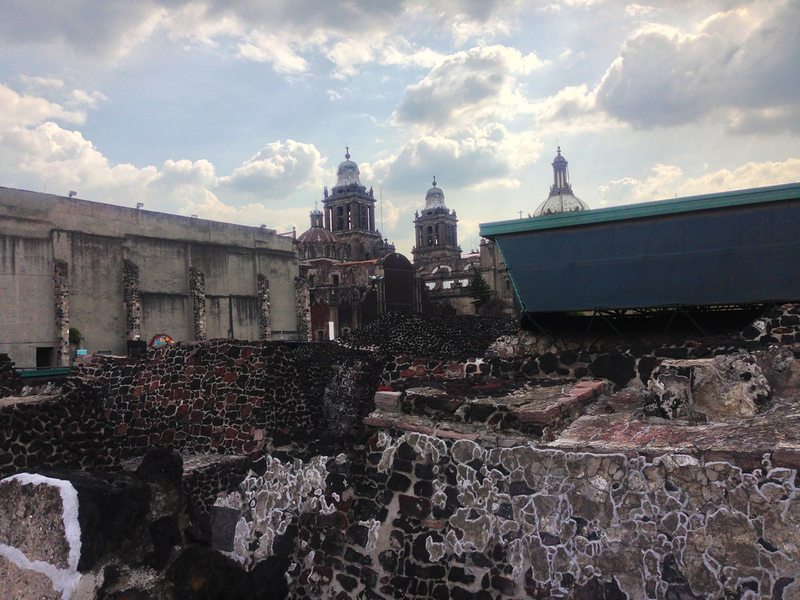 Mexico City: In the foreground,the ruins of Tenochtitlan’s Templo Mayor; in the background, Spanish Colonial buildings. On our first full day in the city, we took a tour with Eat Mexico who provide food walking tours geared towards English speakers. I loved the four-hour tour of markets and street food because I feel like it gave us our Mexican food training wheels–we learned what dishes were called, what we liked, and from that point on we were unafraid to pull up our seats to a street food cart and dig in. But I also had a sort of historical revelation as we stood in the market. There is one square…where are daily assembled more than sixty thousand souls, engaged in buying and selling ; and where are found all kinds of merchandise that the world affords, embracing the necessaries of life, as for instance articles of food…There is a street for game, where every variety of birds found in the country are sold, as fowls, partridges, quails, wild ducks, fly-catchers, widgeons, turtle-doves, pigeons, reedbirds, parrots, sparrows, eagles, hawks, owls, and kestrels ; they sell likewise the skins of some birds of prey, with their feathers, head, beak, and claws. There are also sold rabbits, hares, deer, and little dogs, which are raised for eating and castrated. There is also an herb street, where may be obtained all sorts of roots and medicinal herbs that the country affords. There are… restaurateurs, that furnish food and drink at a certain price… There are all kinds of green vegetables, especially onions, leeks, garlic, watercresses, nasturtium, borage, sorel, artichokes, and golden thistle ; fruits also of numerous descriptions, amongst which are cherries and plums, similar to those in Spain ; honey and wax from bees, and from the stalks of maize, which are as sweet as the sugar-cane; honey is also extracted from the plant called maguey, which is superior to sweet or new wine ; from the same plant they extract sugar and wine, which they also sell…maize, or Indian corn, in the grain and in the form of bread, preferred in the grain for its flavor to that of the other islands and terra-firma ; patés of birds and fish ; great quantities of fish, fresh, salt, cooked and uncooked ; the eggs of hens, geese, and of all the other birds I have mentioned, in great abundance, and cakes made of eggs;, finally, every thing that can be found throughout the whole country is sold in the markets, comprising articles so numerous that to avoid prolixity, and because their names are not retained in my memory, or are unknown to me, I shall not attempt to enumerate them. The little, castrated dogs for eating are generally thought to be Chihuahuas, which recent DNA testing has deemed a “native dog”: one of a handful of species that did not come to the Americas with Europeans, but by an earlier Asian migration. And the “maguey” plant is agave; the agave “wine” they’re selling is pulque. For more reading on Central American culture, I recommend 1491: New Revelations of the Americas Before Columbus . I read it right before my trip and it BLEW MY MIND. Events: Cocktail History and Chili Powder History! I’m back! And I’ve got two events coming up in the NYC area: The history and future of COCKTAILS and an exploration of the evolution of Chili Powder! $5 gets you admission, two free beers and 10% off purchases at the Kitchen. Buy tickets here! The cocktail is credited as one of America’s greatest inventions. But where did it come from, and how did it evolve into the endless combinations we find today? Sarah will examine the dawn of the cocktail and trace the origins of some of our country’s most beloved imbibements. You’ll walk away with a new appreciation for the drinks that got your ancestors drunk. BIG IMPORTANT NOTE! : MSG mooooving on over to Brooklyn Kitchen this month, where your $5 admission will get you 2 drink tickets and 10% off anything your heart desires. Doors at 6:30, talks shortly thereafter! Awesome? Yes. You can buy tickets at the door but there is a limited capacity; buy in advance here. What was chili’s path from a local dish of the Southwest to an easy weeknight meal for millions of Americans? There was an era when black pepper was considered spicy; but today, we make ourselves sweat with the hottest chili pepper blends. Why? Can science offer an explanation for our obsession with heat? From traditional spices to national chili cook-offs, we’ll discover how the distribution of commercialized chili powder affected our eating habits and how it fits into our national pantry. We’ll look at the roots of chili in Mexican cuisine, as well as the “Chili Queens” of San Antonio. We’ll learn how chili made its national debut at the 1893 world’s fair, and how this Tex Mex dish became a part of Americana from Washington DC to Cincinnati to Texas. This class will include a tasting of chili cooked from a recipe in the first Mexican-American cookbook published in 1908. Buy tickets here!